With Matt heading home the previous afternoon, we were down to a party of four for our second and last day in Nevada's Valley of Fire State Park. Much like the first day, I had a handful of peaks from Purcell's Rambles & Scrambles to keep us busy for the day. It was a nice selection that included the sandstone highpoint of the park and a retry of The Orphan that we'd failed on the day before. This is perhaps the longest summit hike in the park and one of the trickiest, making for one an excellent scramble. The sandstone highpoint lies only 4/5mi west of Mouse's Tank and the paved road, but our wandering route would cover more than five miles in a busy loop that had few easy sections. We started from the picnic area at Mouse's Tank, the same place we'd used for our BBQ the day prior. We headed northwest up one of many different washes we'd visit on this circuit. I had gotten a GPX track from Matthew Hengst off PB and was using this to guide us to the summit and back. We made a few improvements on the route, but overall found it a good one. Our ascent route was from the north, taking us about an hour to reach the base of the peak on that side. We traveled past interesting rock features, up several slots, in and out of more washes in the process. One slot in particular was narrower than the width of one's body with vertical sides rising high on either side - it was necessary to slip sideways through this, sometimes with back and chest against the opposing walls - not a place for the claustrophobic. The NW Ridge we ascended was a neat staircase of patterned sandstone rising up to the highpoint. There is a split partway up where one can choose one of two options. Tom and I headed left to a point just across from the highpoint but a few feet lower - and no way to get across from one to the other. Scott and Iris, having taken the right fork, mocked us from the true summit as Tom and I headed off to backtrack our way to a narrow spot in the chasm that we could step across - a most unnerving manuever. We reached the summit with the others by 9a after an hour and half's effort. There are fine views from the summit which we enjoyed a great deal despite the early morning chill still in the air. After about 15min, we headed down to check out the odd picnic benches below the summit to the south, next to a tenaja with a fine, clear pool of water. 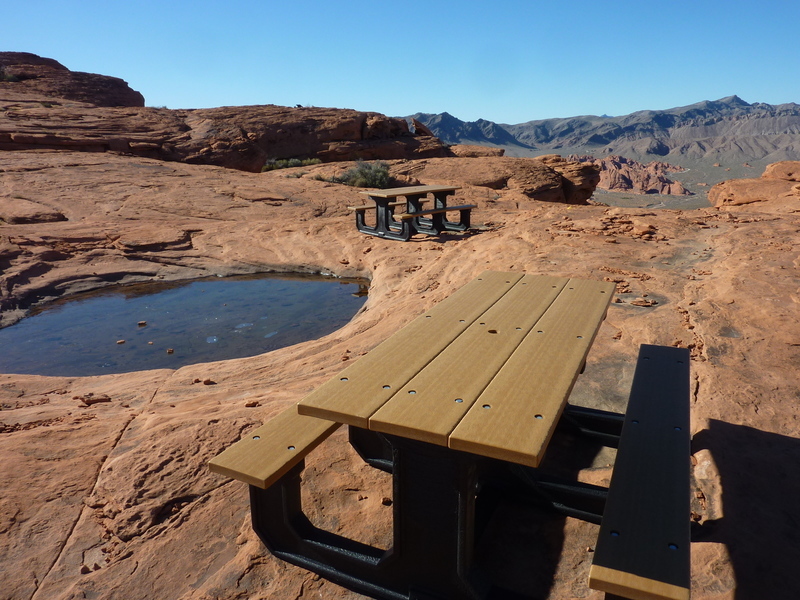 Supposedly, these tables are used by wedding parties helicoptered here - no getting around that we were just a short flight away from Las Vegas. The south side route that we used for the descent was far trickier than the ascent route and without the GPX track it might have taken us much longer. It was quite convoluted, but we did well to follow it with a couple of shortcut improvements, too. After descending most of the "ridge", the route turns east to drop us into the complex of washes and sandstone features where options are more abundant and strictly follow the track not really necessary. There were some surprisingly grassy sections and a few delicate scrambling moves, but most of this was a romp that could go in almost any direction. Shortly after 11a we ended up at the road with a half mile hike back to the picnic area. We had actually staged our second vehicle nearby to make it even easier, but since I was ahead of the others when we got to the pavement, I just kept walking past Tom's Jeep to the start of the route, arriving less than a minute before the others pulled in with the Jeep. Tom had injured his foot on the return of the morning hike which was why he was slower exiting to the road. He didn't think he was going to be able to do any more serious scrambling, so we chose to do the easy hike to Silica Dome, a short outing not on our agenda. The roundtrip distance is about a mile with less than 200ft of gain from the Silica Dome TH where we started. A trail goes most of the way to the top, with the last few hundred feet over solid sandstone footing. The popular hike is perhaps too popular, judging by the amount of graffiti carved into the soft rock around the summit. The top provides a good viewpoint overlooking the park and the half dozen or so features we'd already climbed. Tom planned to take it slow on the way back so we bade him goodbye there before heading down. This pair of sandstone features are found immediately south of the White Domes TH at the end of the paved road. We were surprised to find the TH closed, the road gated at the Gibraltar Rock parking area, as it had been open just the day before. The TH, we found, was closed to allow a construction crew free access to the TH to build a retaining wall behind the restrooms. Luckily, it was easy enough to park at the Gibraltar lot and hike from there as it was only a quarter mile due east of the White Dome TH. The two rock formations are separated by a wash running north-south and composed of red & white sandstone. The east dome has a bit of class 4 scrambling in the middle which probably keeps this short climb from being more popular. It took about 45min to climb both the east and west formations, each providing nice views from the summit to complement the enjoyable scrambling.